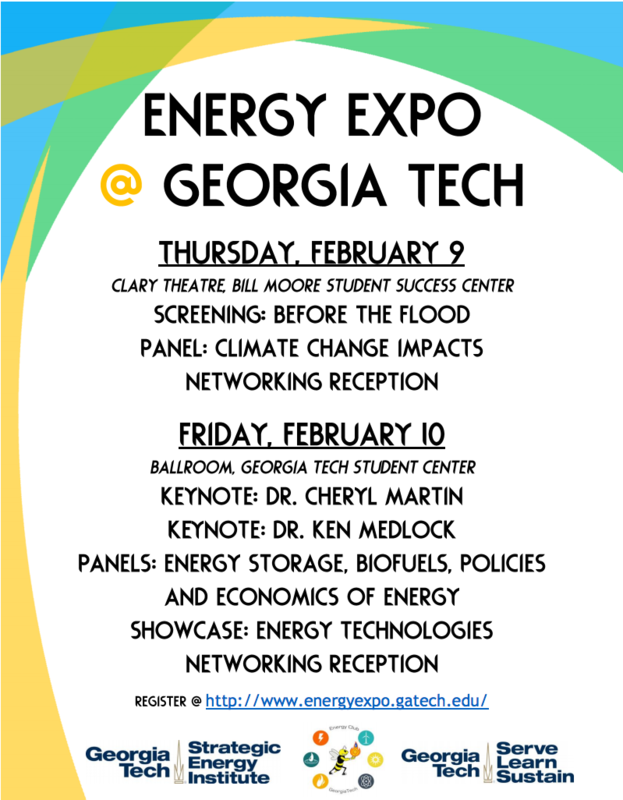 All HSOC students are invited to attend the GT Energy Expo on February 9th and 10th. See the following letter from HSOC undergrad alum, Marcela Moreno. Of particular interest may be the documentary screening of Before the Flood followed by a panel on climate change (part of Serve-Learn-Sustain's EJ series, and also sponsored by the Strategic Energy Institute), and a panel focused on policy and economics that has Dr. Kate Pride Brown. I am writing to invite you to attend the upcoming 4th Annual Energy Expo, hosted by the Georgia Tech Energy Club. The Expo will take place Thursday and Friday, February 9th and 10th. I've attached a promotional flyer to the invite, but please visit our website for a full schedule and list of speakers and register for the event via Eventbrite. Students can receive free registration by presenting at the Showcase or volunteering to help at the Expo. This two day event includes keynote addresses by Dr. Cheryl Martin of the World Economic Forum, and Dr. Ken Medlock of the Baker Institute for Public Policy at Rice University. The Expo also features panel sessions on: Climate Change’s Impact on Energy, Sustainability, and Equity; Assessing Biofuels for Sustainable Development; Integrating Renewables with Energy Storage; and a future outlook for Energy Technologies, Economics, and Policy. The event concludes Friday (2/10) at 4:00pm with a networking session and Showcase where students, researchers, and industry are encouraged to present a poster, demonstration, or have an information booth. Let me know if we can provide you with any additional information or answer any questions by emailing energyexpo.gt@gmail.com.